The Taste of Chicago is certainly a great way to try out some dishes from all sorts of vendors, but I prefer taking a culinary adventure of my own with my monthly Neighborhood Taste Tours. Today friends and I ventured out to the neighborhood of Pilsen, which is located southwest of Chicago's loop. 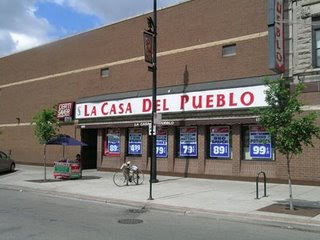 Here you'll find an area rich in Mexican culture and food... which offers a true Taste of Chicago. A palace of all things porcine, this neighborhood favorite serves platters piled high with steaming carnitas made from succulent pork chunks that have been slow-simmered then braised. Add crispy chicharrones and this is pig-lovers' heaven. which we all stuffed into corn tortillas to make tacos! After a fire burned out the Bombon Bakery flagship down the street last summer, pastry chef Laura Cid-Perea relocated to this bakery. Thankfully, her cakes remain as heavenly as ever, especially the tres leches and the individual-sized confections. Our favorite sugar rush comes from the pretty Mini Luisito, a vanilla cake spiked with mango and white chocolate. Places specializing in traditional goat stew are rare in Chicago, and few are as focused. With only about a half dozen selections, this unassuming spot is clearly the work of a specialist. One bite of the savory tacos and you'll agree with the sign by the door proclaiming this the mejor birria del mundo. The best of the genre are surprisingly from the local wholesaler. Fresh, fried, sweet pastries filled with chocolate, strawberry or vanilla cream. Need I say more? OK, flaky sugared elephant ears too. What would a Mexican neighborhood food tour be without some churros?! We stopped into Mr. Churros (aka Don Churro) and got a sneak peak of how they get their delicious fillings inside! just like most bakeries that serve up filled doughnuts, churros are filled using the same equipment. Filling is shot into a hollow churro and then gently coated with cinnamon sugar. Mr. Churro offers up a nice variety of filled churros including strawberry, chocolate, caramel, bavarian cream and plain/hollow ones. I don't believe I've ever seen so many churros at one time! Amidst all the latin fare in the Pilsen neighborhood, this place specializes in Korean chicken wings! These wings are unlike no other and you'll be able to try them on our tour! This popular neighborhood supermercado features hard-to-find fresh produce like cactus leaves and plantains, an extensive selection of dried chilies and an intriguing butcher case with items like cow's hooves and cesina. The tour was a wonderful way to spend the day! While many folks were getting their fill at the "official" Taste of Chicago, I'm glad that my friends and I got a chance to meet some wonderful locals who gave us a true taste of Chicago in the Pilsen neighborhood. If you ever get a chance, please visit the above establishments... you won't be disappointed! Pilsen is one of my favorite neighborhoods. The residents are really taking back their neighborhood and the murals are fabulous. Take the walking tour of the murals sometime--it's really impressive. And I have to say that Mr. Churro is the BEST place to get a churro in Chicago, hands down. Oh my gosh, Joelen! The food looks A.MAZ.ING! I had an omelette with nopales in Mexico one time and it was so flavorful. And CHURROS?!?!?! My mouth is watering. Had those in Mexico, too, and would do anything for some right now!!! the cakes and churros look tasty! what a fun day! Your eating adventures always make me so jealous! I bet you never get tired of that amazing view.